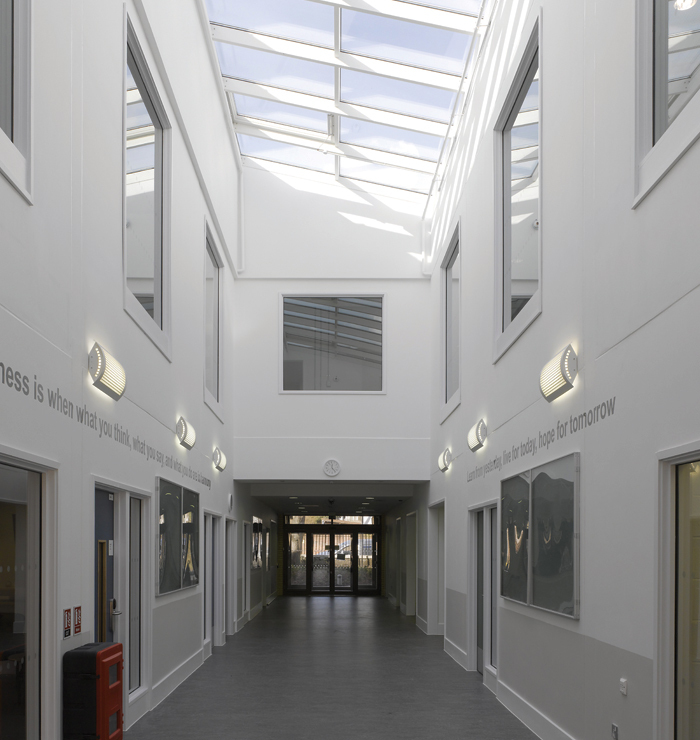 When dRMM won the project to provide new educational facilities for Exeter Royal Academy for Deaf Education back in 2004, it had only some idea of how complex the needs of the school community would be, and even less idea of how tricky it would be to fully engage those for whom verbal communication can be highly problematic. But the biggest, and happiest, surprise was how enthusiastically this group would embrace the challenge of evolving a groundbreaking, multisensory design. Philip Marsh, dRMM director and project lead for the scheme, describes it as ‘perhaps the most proactive of any school we had engaged with’. ‘We were exposed to everything, from the dinner ladies to the inner workings of the school kitchen to the staff who provide additional learning and residential activities.’ Marsh says, the hardest thing, initially, was for the staff to envisage a world that might be different from what they were used to – a highly institutional structure, whose last architectural interventions had been in the Sixties. So dRMM devised a series of exploratory exercises. Consultations involving visual simulations and conversations with interpreters were enhanced with some unusual tools. First, dRMM sent the pupils around the school with red and green disposable cameras. With the red cameras they were to record the areas they didn’t like. On the green ones they should record areas they did like. What emerged was a very strong narrative about qualities of light. It’s well known that being deprived of one sense makes one highly attuned to others. With hearing loss, visual senses become far keener, including sensitivities to certain kinds of light. Says Marsh: ‘When it comes at them from the sides, they get glare and that’s hard to deal with. Light from above is far superior.’ Distraction was also an issue – large windows on to activities tended to be less than optimal; how can your teacher bring your focus back into the classroom when you can’t hear them speak? Corridors were also revealed as a problem – without the aural signal of approaching footsteps, how do you prepare yourself to encounter someone who is just around the corner? Marsh and his team set up an interactive workshop to get the children involved, which included creating a cardboard mini-classroom, complete with chairs, tables – even trees – to facilitate discussions about form, space and light. An intensive investigation into acoustics, via Adrian James Acousticians, was also crucial. The vast majority of children labelled ‘deaf’ are not totally deaf; they often have greatest difficulties hearing the human voice. But that doesn’t stop them from making a lot of noise themselves. So, acoustics had to be taken very seriously. In the resulting scheme, connecting corridors were faceted at the corners to flag up junctions, with mirrors placed strategically to show who may be approaching. The different schools within the campus – pre-school, primary, and secondary – were all given different identities, reinforcing a sense of progression and clarifying the structure. At the heart of the building was a ‘learning forest’ – a PTFE-roofed atrium space that looks up to a first-floor cafe. This floor prioritised spaces where students can learn skills – such as working in catering – that could enable them to enter the mainstream workforce. The proposed building had a triangular shape, with a colourful exterior with the ETFE-roofed atrium providing that desired top lighting. Says Marsh: ‘We learned that as a deaf child develops and acquires independence and language, the need to integrate with the mainstream is of paramount importance, so we have strived to nurture “reverse inclusion” – that is, to enable the hearing world to experience and learn about the deaf world on deaf terms, through the provision of services such as health and leisure facilities that are mutually beneficial to both communities.’ Although the architectural proposal was fully finished in 2015, fundraising targets sadly were not met, so the project has been put (temporarily, one hopes) on hold. But this approach – finding a way to support and engage children with special needs through the exploration and deployment of targeted sensory stimuli – now seems to be one of the most enlightened and exciting approaches for SEN schools. Studio Weave, one of the UK’s most innovative practices, is currently completing two special needs schools, both primarily for children with autism, and both deploying nature as the key element in a multi-sensory learning strategy. One, completed this summer, is Belvue, in West Ealing. 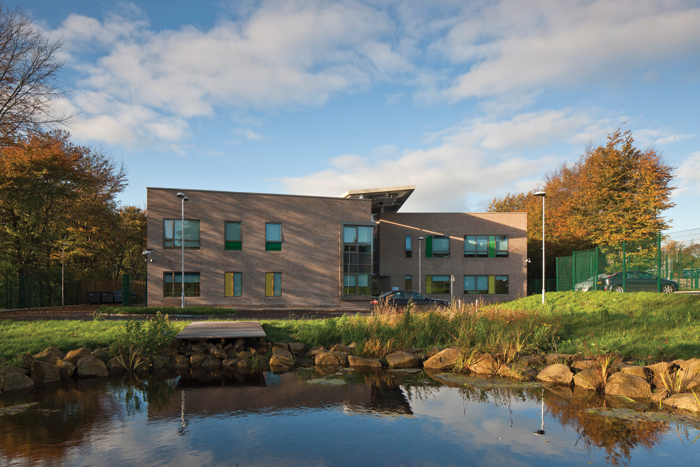 With the main school building right next to a major road, the school asked Studio Weave to help it make greater use of some woodland to the rear of the school site. The other Studio Weave project is Greenbanks, in Barham, Kent (see case study), where a pioneering charity has combined a programme of education, recreation and residential care with two models of business – horticulture and catering – through which its students with special needs can both learn a skill and earn a living. Integration with the outside world is the ultimate aim of the most progressive SEN schools, and for this to be possible head teachers prefer an environment that doesn’t overly cater to that community’s particular difficulties. Ahn says: ‘Often if you speak to a special needs teacher they say that’s the wrong thing to do. If you make everything too easy for the students it doesn’t help them to deal with reality. Better integration with the community is at the heart of the new scheme being created by PH+ Architects for the London Centre for Children with Cerebral Palsy (LCCCP), which offers shared community facilities – including hydrotherapy pool, physiotherapy and meeting spaces – in Haringey. The school programme is based on a Hungarian educational philosophy called Conductive Education – a highly physical form of learning that encourages children to embed knowledge by activating different parts of their brains through movement or sensory engagement. Though it has now received planning permission, the charity is still short of its final funding target (with a hoped-for deadline of next July for construction to begin). 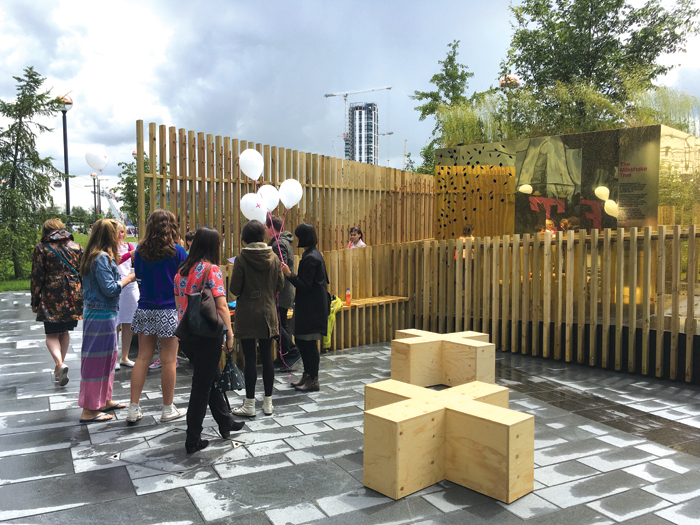 So PH+ devised an exploratory version – a real Milkshake Tree – for the 2016 London Festival of Architecture, which proved both the enduring appeal and impact of sensory exploration, for children of all abilities.